Veterinary drugs have established importance in the treatment of numerous diseases growing in animals. Veterinary drugs including antibiotics and amino acids are developed in order to minimize the attack of harmful virus and bacterial parasites in animals. Introduction of advanced cost effective veterinary drugs, rising clinical animal researches in order to treat diseases and other disorders, increases safety and effectiveness of veterinary drugs, thus swelling the demand for veterinary globally. Increasing investments in research and development in order to develop more effective and safe veterinary drugs with fewer side effects are beneficial for the growth of veterinary drug industry. Rising awareness towards healthcare and well-being of livestock companion and pets and introduction of animal immunization policies by the government organizations in many developing nations such as China are likely to shift consumers from conventional treatments to advanced veterinary drugs. The global veterinary drug market is predicted to flourish significantly at a CAGR of 6.8% over the forecast period i.e. 2016-2023. 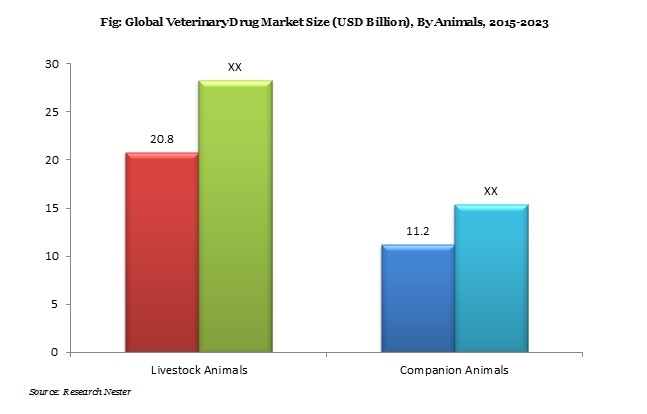 Moreover, the market of veterinary drug market accounted for USD 25.3 Billion in 2015 and the market is further anticipated to garner USD 49.8 Billion by 2023. The livestock companion diseases are increasing burden which leads to an increase in animal healthcare expenditure. The nations facing economic issues are likely to adopt cost effective and efficient veterinary drugs in order to minimize the burden in terms of economic cost and decrease the animal healthcare expenditure. Further, emergence of pharmaceutical and biotech companies, huge investment in animal healthcare and rising initiatives from government authorities to develop cost effective and safe drugs in order to minimize the animal diseases burden in terms of animal suffering are some of the factors exhibit the positive growth of veterinary drugs in near future. Rise in number of pet ownership and increasing concern towards health and well-being of animals among the owners are some of the key elements which are expected to bolster the demand for veterinary drugs in near future. In addition to this, factors such as introduction of cost-effective and efficient veterinary drugs, availability of numerous veterinary drugs for treatment of several diseases, rising drugs preferences by pet and poultry farm owners and increasing demand in research laboratories to deliver more effective drugs for the treatment of severe diseases are some of the key elements expected to prompt the demand for veterinary drugs over the forecast period i.e. 2016-2023. However, increasing cost of animal healthcare, growing variety of diseases in animals, lack of awareness in undeveloped nations, requirement of huge expenditure for research and development of veterinary drugs are some of the factors likely to inhibit the growth of veterinary drugs market in near future.